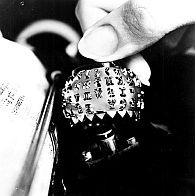 July 31st was the 50th birthday of the IBM Selectric, which may have been the most popular typewriter ever sold [link]. The swappable typeball was revolutionary for its time, and to quote Wikipedia. The possibility to intersperse text in Latin letters with Greek letters and mathematical symbols made the machine especially useful for scientists writing manuscripts that included mathematical formulas. Proper mathematical typesetting was very laborious before the advent of TeX and done only for much-sold textbooks and very prestigious scientific journals. In 1997, it was time to publish my PhD. thesis (100 plus pages and well over 100 formulas), I found a typist in NYC who would charge $1.00 per page plus $1.00 per formula. Even though the symbol typeball made formulas possible, it still took her longer to do a single equation than a whole page of text. My how technology has changed but I think having gradually absorbed new technology I still underestimate its impact. Then yesterday, I came across this wonderful post [link] on a group of college journalist who tried to publish a newspaper using technology from just twenty years ago (but there is no 1 key !! !, use the lowercase L instead). Besides their experiences, there are a couple of memorable quotes that I found quite profound. We are losing touch with old technology and while we are relatively good at saving content, the processes are being lost at an alarming rate. The second quote was from one of the student journalists. Technology hasn’t made us lazier, but it has made it possible to be lazier while still producing the same amount of quality work. Now that I’ve realized this, I know I’ll definitely be working faster to produce more quality news. And unlike the ancient civilizations of the 20th century, I’ve got the technology to do it. This entry was posted in Business Model, technology, Uncategorized and tagged IBM, newspaper, selectric, technology, typeball by geoff. Bookmark the permalink.